How to replace a string on your Hammered Dulcimer. When replacing Hammered Dulcimer strings, it is important to remember that different makes and model of Dulcimer are strung differently. A Hammered Dulcimer has 2 strings per note, which are tuned separately to the same frequency to achieve the sound of one note. The strings used to create a note are called a ‘course’. Most Dulcimers have 2 individual strings and 2 hitch pins per course. (See image 1). A hitch pin is found on the far left hand side of the Dulcimer and is used to anchor the string to the instrument. Some Dulcimers have only one hitch pin per course. These Dulcimers use one string looped around the hitch pin, which doubles back on itself, thus creating the effect of 2 individual strings. To use one piece of string doubled up in this way, is sometimes referred to as the ‘continuous string method’ (See image 2). You will need to look at your Dulcimer to determine whether you will need 2 separate strings or one double string. Methods used for replacing a Dulcimer string. 1. Using string by the roll, or string without pre-made loops (Continuous string method). 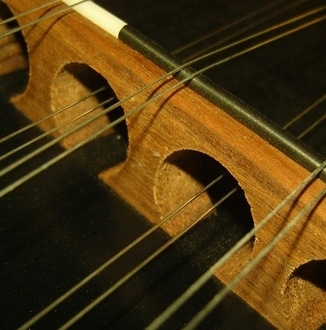 Dulcimer string can be ordered by the roll or can be supplied cut to size. To buy string by the roll is sometimes seen as the cheaper method of string replacement, as you are in effect buying in bulk. This method can be a bit more time consuming and fiddly. This is because you have to make your own loop at one end, which is placed over the hitch pin of your Hammered Dulcimer. If your Dulcimer has only one hitch pin per course, you will need to use the continuous string method. 2. Using string with pre-made Loop ends (Loop end string method). The second method is to use loop end strings. A loop end string comes ready made with a small loop at one end, which is placed over the hitch pin. Loop end strings tend to be easier to use. If your Dulcimer has two hitch pins per course, then you can use either the Loop end string method or continuous string method. I will cover both methods in detail below. Things that you need to do before restringing your Dulcimer. 1. You need to make sure that you have the correct string for the job by finding out which ‘gauge of string’ you require! 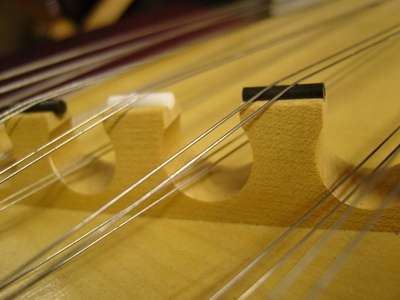 Hammered Dulcimer strings are generally measured by their gauge, (the thickness of the string). Some Dulcimers use strings of more than one type of metal and thickness, like brass or phosphor-bronze, or steel wound strings. The gauge will also depend on the make and supplier of your Dulcimer. Different suppliers use different gauges! Most Dulcimers come with a tuning chart. This chart will normally include information on the particular metal and gauge of string that your Dulcimer uses for each note. If you do not have your gauge chart, or are not certain on the gauge of string you require, then do not hesitate to contact me by email at [email protected] with the make and model of your Dulcimer, and I will assist you in ordering the correct string. Note: Please be gentle and take time and care during all steps of the restringing process, otherwise you risk damaging your new string and/or your Dulcimer! Take time to look at how the rest of your Dulcimer is strung, this will help in understanding the restringing process. It is recommended that safety goggles are worn at all times, as it is possible for the string to break and splinter when replacing. Step by step instructions for replacing your string. When you have ordered and received your new string, it is time to remove the old string. Start by loosening the tuning pin enough to remove the loop from the hitch pin (the pin on the far left hand side of your Dulcimer). Then take the string off the bridges. Next fully unwind the string from the tuning pin. If you find any bits of the string hard to remove carefully use your wire cutting pliers to help you. Using your tuning wrench, further unwind the tuning pin until the hole in the pin is about 7mm above the surface of the wood. 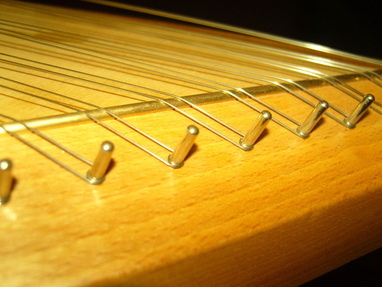 (This needs to be done to ensure that when the string is re-tightened, the pin will reassume the same height as the rest of the tuning pins on your Dulcimer). Turning the tuning wrench to the left will increase the distance between the hole in the tuning pin and the surface of the wood. Turning the tuning pin to the right will decrease the distance between the hole in the tuning pin and the surface of the wood. TIP: 7mm is about 3 full turns of the tuning pin and is also approximately the same width as an average sized pencil. If you have a pencil to hand you can use it as a measuring guide. You are now ready to thread your string. This step is to be followed if you are using string from a roll or string that has been supplied already cut to size, and your Dulcimer has only one hitch pin per course. The string will need to be looped around the hitch pin. This loop needs to be EXACTLY the same as the others on your Dulcimer. (see image 3). If you are using string from a roll, cut a long piece of string to work with, (at least twice the width of your Dulcimer, plus a bit extra to play with). Hold the string across the Dulcimer so that one end of the string starts about 5 cm’s beyond the tuning pin. This extra 5 cm’s will be used to thread through and coil around the tuning pin (see steps 4 & 5). Look closely at the other loops on your Dulcimer. (See image 3). You will notice the string is wound twice around the hitch pin to create the loop. Make your loop where the string reaches the hitch pin. Use your round-nose pliers to do this. Make sure your loop is wound in the same direction as the other loops on the instrument. The second end of the string should now be running back on itself across the instrument. Cut off the second end so that it is level with the first end, about 5 cm’s beyond the tuning pin. Proceed to step 4. This step is to be followed if you are using string from a roll or string that has already been cut to size, and your Dulcimer has two hitch pins per course. You will need to make your own loop to go around the hitch pin. This loop will need to be EXACTLY the same as the others on your Dulcimer. (See image 4). First bend a loop about 5 cm or 2 inch’s from the end of the string. The string should now look like it has a hook on one end. Use your flat-jaw pliers to hold both ends of the loop securely (See Image 5). Put a small round bar (i.e a screwdriver) into the middle of the hook and tightly twist the short end of the string around the long end, about 5 twists. (See image 6). Remove the pliers, and by hand, coil the rest of the short end of string tightly around the long end, and cut off, leaving a small tail of approx 2mm (see image 4). Note When you come to place the loop over the hitch pin (in step 5), ensure that the tail that is left is lying under the string, against the surface of the instrument, as opposed to being on top of the string. This keeps it safely out of the way. Repeat step 3 for your second string. (Remember as you have 2 hitch pins, you need 2 individual strings for one course). Thread the string through the bridges. Ensure that the loop end is pointing toward the hitch pin. On certain models (i.e TK O’Brien) there is a designated hole that the string will need to go through on the bridge. (See image 7). Other models (i.e Dove Dulcimers, and Dusty Strings) have a specific groove for the string to sit in. (see image 8). Place the loop over the hitch pin and thread the other end through the tuning pin. Trim the string with your pliers, leaving about 3 inches of length sticking through the hole of the tuning pin. TIP: use a crocodile clip or masking tape to hold the string securely in place at the hitch pin. 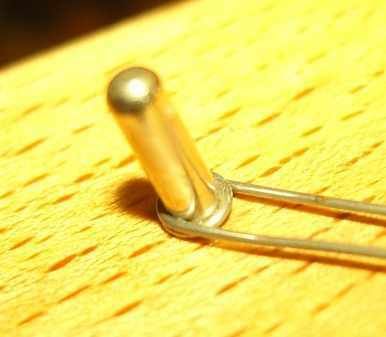 This enables you to thread the tuning pin more easily. 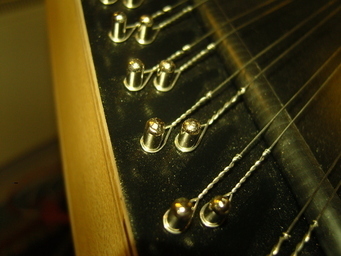 With the tuning lever wind the tuning pin clockwise (to the right), about 3 complete turns until the string begins to tighten. Now check your work by looking at the string. Is it running straight and parallel? Is the string at the hitch pin end flush down to the wood? Now you need to tune the string. Tighten the string by turning the tuning pin with your tuning wrench until you reach the correct frequency. Follow the tuning guide for your dulcimer to determine the correct note. If possible use an electronic tuning device (like the Korg CA-1) to help you tune the note accurately. Use your Flat-Jaw pliers to trim, fold back and press down the excess wire sticking out of the tuning pin. It is best to fold it back in an anti-clockwise direction. Congratulations you have replaced your string!